We confirm Mike Ellis to be a 20th/21st die variety attributer. We officially nominate (on behalf of the entire club) Mike Ellis for a seat on the ANA Board. We appoint Mike Ellis as an additional moderator to the CONECA Forum AND to nominate Jim Motley as our Web Tech replacing Bill Crosier. We approve the reimbursement of Don Beard for expenses of obtaining a table at the World’s Fair of Money in Chicago 2011 for the amount of $230.00. 1) Class 1: This award will be given annually to the individual/entity sponsoring the most new members in an awards year. An Awards Year will run from May through the end of April of the following year in order to give the Membership Chairperson time to prepare the award and have it ready for Errorama. A individual/entity will only qualify to win this award one time. Authors of books where there is more than one author involved such as Cherrypickers’ Guide; web sites, numismatic periodicals and the like will quality for this award but only one award will be given to a representative of that entity. In the event of a tie, it will be broken by whichever individual/entity has brought in the last recruitment first. In the rare event that two (or more) individuals/entities are tied on the same date for their last recruitment, both (or more) will receive the award. 2) Class 2: Awards will also be given out to individuals/entities when they reach 25 , 50 and 100 recruitments. There will no time limit as to how long it takes to reach any of these milestones and thus there may be some years when none of these awards are given out and other years where multiple awards may be given out. 2) Class 2: Awards will also be given out to individuals/entities when they reach 25, 50 and 100 recruitments. There will no time limit as to how long it takes to reach any of these milestones and thus there may be some years when none of these awards are given out and other years where multiple awards may be given out. 3) At the point that any individual/entity has received the Class 1 and all three Class 2 Awards, it will be considered a Kenny Knapp Grand Slam Award and be sited as such in an appropriate manner on the plaque given to the individual/entity. Those who already qualify by having already received awards for 100 or more recruitments and have been a top recruiter in one or more years since the Kenny Knapp Award Program was first initiated, will receive a Kenny Knapp Grand Slam Award retroactively. Kenny Knapp will be given one posthumously in a manner that the Membership Chairperson best sees fit. The Kenny Knapp Grand Slam Award will be the ultimate achievement but may not be repeated a second time. It will be like being inducted into the CONECA Hall of Fame, you can only get in once but you are there forever. The Kenny Knapp Awards will be issued to recipients or their representatives at CONECA’s annual Errorama. Should the winner(s) not be able to attend, the Membership Chairperson or his or her representative will mail the award to the winner(s). Ken Potter be reimbursed for all costs associated with the booking of the 2011 CONECA Awards banquet room that he placed on his credit card for any amounts that exceed the deposit of $500 that Mark Lighterman put on the room thus far. Those total costs can be estimated by reviewing the attached contract. Furthermore, I ask for approval for reimbursement of all costs that Ken Potter paid for with his credit card for the CONECA club table at the ANA Word’s Fair Of Money in Chicago which includes the cost of the table at $150, electricity at $60 and $20 for an extra display case. All other reasonable hidden costs such as sales taxes, etc., will be covered by CONECA. Furthermore, in discussions with Donald Lannon, he suggested that it made no difference to him who had the Literary Recognition Awards produced; that it could be him or Ken Potter. Ken Potter has decided to have them produced locally to save on time and shipping costs to him and from there to the Awards banquet. The costs associated with these awards fall in the $15 range give or take a few dollars either way plus shipping costs to those who are not present to receive them at the banquet. CONECA will reimburse Ken Potter for all these costs which he estimates will be about $375 including shipping. In addition, James Motley will be reimbursed for his costs of producing the Kenny Knapp awards as he has outlined previously with an estimated cost of about $500.00. Accept Mike Diamond’s letter of the resignation as President of CONECA and grant Mark Lighterman current Vice President the right of succession to assume the office of President with all rights and duties that come with the position. We to appointment Ken Potter as CONECA’s advertising manager. 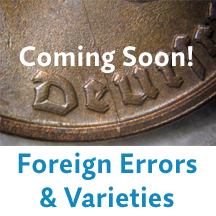 That the dues for Young Numismatists be changed as follows: On-line memberships for Young Numismatists under the age of 18 are $7.50, dues for those wanting to receive a hard-copy version of ErrorScope sent bulk rate are $17.50. a) $750 for individuals under the age of 55.
b) $650 for individuals 55 years of age of older. Regular domestic Memberships be maintained at $25.00. Family Memberships (as outlined in the C&BLs) be set at $12.50 per individual living at the same address with one copy of the Errorscope sent per address. Organizational (Club) Memberships be offered (as per the guidelines in the C&BLs) at $25.00. J.G.J. 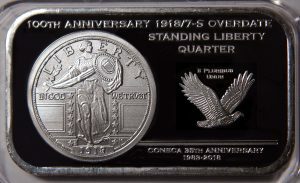 (James G. Johnson) Memberships be maintained “as is” and may be designated as such for any Young Numismatist who is sponsored and paid for by an Adult. Postage rates for those persons desiring first class mail domestically and those living outside of the United States will be determined by the Membership Chairman and go into effect upon the approval of the BOD. These changes may be applied at any time the need arises and they are approved. Ken Potter moves that CONECA establish new rates for examination/listing/attribution fees for 20th and 21st Century United States doubled dies and other variety types listed by James Wiles such as RPMs, OMMs and Mintmark styles, etc, for all eras for members at $5 per coin and $6 for non-members for cents through gold except for any of these variety types found on Kennedy half-dollars and Eisenhower dollars which will be set at $7 for members and $8 for non-members. 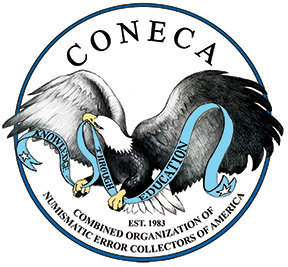 In consideration for the large volume of coins that he will be discounting by $1 per coin for CONECA members, James Wiles who oversees these areas will get one-half page of adverting per issue of Errorscope at no charge retroactive back to our earlier contact with him to continue on as a CONECA attributer. [T]hat the price last established for back-issues of Errorscope the last time it was reviewed (as published on the website and in E/S) remain the same. [To] appoint Mike Ellis to the position of CONECA’s Vice President. [T]hat the current two-thirds of the BOD&Os required either in person or by proxy to make up a quorum for meetings be changed from “two-thirds” to a “majority” of the elective officers. The CONECA Board of Directors hereby grant Mark Lighterman (acting President) and Michael Howard individually and/or jointly the power to sign for CONECA on any and all papers that relate to the State of Indiana and/or any tax forms that are required for the IRS. I hereby motion the CONECA Board to move Jim Checkovich from the position of Treasurer into the vacant Board Seat 4. At the same time, according to the Bylaws of CONECA I hereby make my one appointment to the board and thus wish to appoint Michael Howard as CONECA’s Treasurer with all the duties and powers of the position of Treasurer and officer of CONECA. I also hereby wish to appoint, because of his continued support, Jim Checkovich as CONECA’s Chairman of the Board for as long as he feels well enough to hold the position and can maintain the duties of this office.